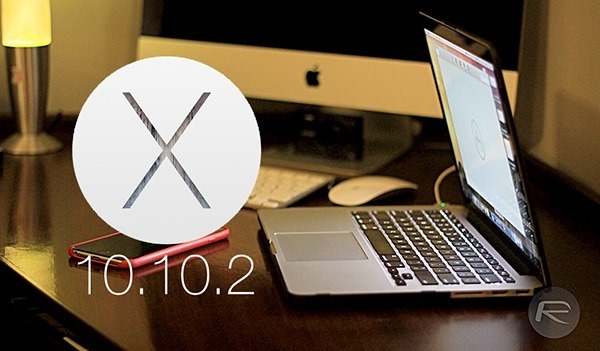 Along with the roll-out of iOS 8.1.3 download, Apple has also introduced OS X Yosemite 10.10.2 to the fold. As indicated by the version number, it’s more of a bug-fix update that improves general stability and functionality than one offering any notable new features, and you can find the full details right after the leap. Yosemite has enjoyed a largely incident-free route to market since hitting the Mac App Store late last year, with relatively few bugs or major issues having arisen during what remains its infancy. Often, those teething issues can hinder the transitional period for many users, but while iOS 8 did hit a couple of roadblocks when it first trickled out to the community, the same cannot be said for the latest flavor of OS X. Despite the lack of any significant problems, though, Yosemite has endured one or to minor issues, and with today’s launch of version 10.10.2 via the Mac App Store, Apple has sought to address them. For example, some some users have found their Wi-Fi to randomly disconnect without warning, while others have been forced to endure slow-loading Web pages. OS X Yosemite 10.10.2 should fix these bugs, as well as others pertaining to Spotlight, VoiceOver and Safari. 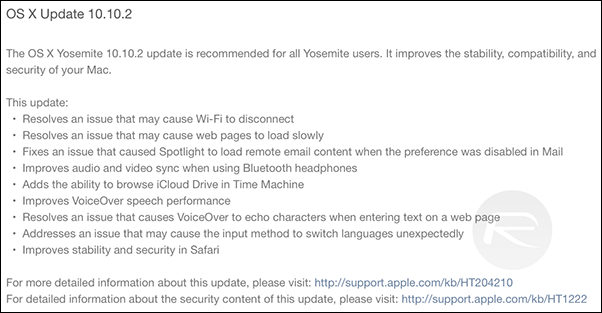 As reported in the release notes, this new edition of Yosemite also improves audio / video sync when using Bluetooth headphones, and as of this update, Time Machine users will also be able to browse iCloud Drive. iOS 8.1.3’s imminent release had been touted throughout January, and now, both mobile and desktop software have been updated at the same time. On first impressions, both OS X 10.10.2 and iOS 8.1.3 seem fairly innocuous and unspectacular, but until we’ve had a proper chance to take a look at it, there’s no telling what Apple may have sneaked into these releases without revealing in the notes. Still, we’re installing OS X 10.10.2 Yosemite as we speak, and should we stumble across anything worth discussing, we’ll be sure to update you guys accordingly. As ever, you can update your Mac via the Mac App Store under the Updates tab, where the update should be live immediately, and if you happen to find anything of note once you’ve installed and rebooted, be sure to let us know via the comments section! Try repairing permissions after an update. It’ll usually speed things up.